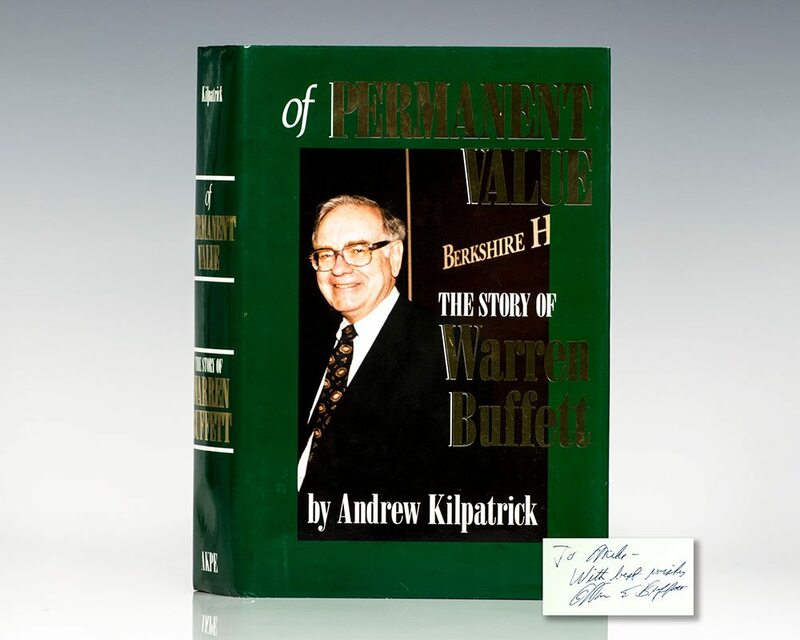 Of Permanent Value: The Story of Warren Buffett. Warren E. Buffett) Andrew Kilpatrick. New York: AKPE , 1994. First edition of this “definitive story of Buffett’s career” (The London Telegraph). Octavo, original cloth, illustrated. Inscribed by Warren E. Buffett on the front free endpaper, “To Mike- with best wishes Warren E. Buffett.” Fine in a fine dust jacket. Jacket design by Nancy Line Jacobs. Warren E. Buffett is an American business magnate, investor, and philanthropist. He serves as the chairman and CEO of Berkshire Hathaway. He is considered by some to be one of the most successful investors in the world. Born in Omaha, Buffett developed an interest in business and investing in his youth, eventually entering the Wharton School of the University of Pennsylvania in 1947 before transferring and graduating from University of Nebraska–Lincoln at the age of 19. He went on to enroll and graduate from Columbia University where he learned and eventually molded his investment philosophy around a concept pioneered by Benjamin Graham–value investing. He attended New York Institute of Finance to specialize his economics background and soon after began various business partnerships, including one with Graham. After meeting Charlie Munger, Buffett created the Buffett Partnership. His firm would eventually acquire a textile manufacturing firm called Berkshire Hathaway and assume its name to create a diversified holding company. Buffett has been the chairman and largest shareholder of Berkshire Hathaway since 1970, and his business exploits have had him referred to as the "Wizard", "Oracle" or "Sage" of Omaha by global media outlets. He is noted for his adherence to value investing and for his personal frugality despite his immense wealth. Buffett is a notable philanthropist, having pledged to give away 99 percent of his fortune to philanthropic causes, primarily via the Bill & Melinda Gates Foundation. "This is the Buffett 'bible'...It provides the definitive story of his career" London Daily Telegraph). First edition of this early Buffett biography. Octavo, original cloth, illustrated. Signed by Warren E. Buffett on the front free endpaper. Additionally inscribed by Andrew Kilpatrick in the year of publication on the front free endpaper. The last part of the recipient’s name is etched out. Small sticker to the endpaper, fine in a near fine price-clipped dust jacket. Jacket design by Nancy Line Jacobs.